An overview of resources maintained by UBC Archives which may be relevant to research on First Nations history and contemporary issues. These resources document First Nations history and culture in general, and the evolution of UBC’s relationships with First Nations in particular. They include archival materials in all media (textual, photographic, audiovisual, and digital), websites, and Internet-based collections and related resources. This list is not intended to be fully comprehensive, but will serve as an introduction for researchers. The focus is on materials held in the University Archives. Researchers are advised to consult with staff in other Library branches such as Rare Books and Special Collections and Xwi7xwa Library, as well as the UBC Museum of Anthropology, regarding archival materials in their collections. See also Xwi7xwa Library’s research guide Musqueam: Land Beneath Our Feet. Patrons researching specific individuals, groups, or events may find information in other collections and resources maintained by the UBC Archives but not listed here. Archives staff are available to provide assistance. Listed alphabetically – links are to on-line inventories. Aberle was a long-time faculty member in UBC’s Department of Anthropology and Sociology. His academic research specialty, documented in these records, was on the Navaho and other First Nations of the American Southwest. The Akriggs were well-known for their studies of British Columbia history, in particular the origins of B.C. place names. Their papers include many references to First Nations history and languages. 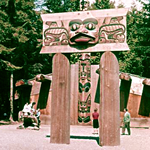 Ames was Director of the Museum of Anthropology (1974-97), and also initiated several First Nations educational and advisory programmes through UBC and the Museum, in particular “Musqueam 101” and the Squamish Language Programme, all extensively documented in his records. Former head of UBC Department of Anthropology and Sociology. Some of Belshaw’s correspondence and research materials are of interest to researchers of First Nations issues. For example, the Research and Academic Work – British Columbia Focus sub-series includes records which address the use of film in relation to First Nations cultures. Personal and research papers of the “grandfather of British Columbia archaeology”. Borden studied the Great Fraser Midden (Musqueam Nation: c̓əsnaʔəm) and many other archaeological sites throughout B.C., and developed methods of examining and classifying sites that are now standard in modern archaeology – these are documented in correspondence, field notes, reports, and other records. Includes extensive documentation of the design and and development of the Museum of Anthropology and the First Nations Longhouse. These are institutional records – access requests are subject to review under FOIPOP (Freedom of Information and Protection of Privacy) guidelines. Records include files on Indian leadership workshops (1962-68) organized by UBC Continuing Education. These are institutional records – access requests are subject to review under FOIPOP guidelines. See also the Marjorie V. Smith fonds regarding Continuing Education’s First Nations education and leadership programmes. Research and administrative papers from UBC professor Wilson Duff, UBC professor of anthropology. He made significant contributions to the study of First Nations cultures, acted as an unofficial advisor to several First Nations organizations, and conducted extensive research on the histories and territories of B.C. First Nations. Faculty records include documentation of the Native Indian Teacher Education Program (NITEP – now known as the Indigenous Teacher Education Programme). Materials collected by Drs. Frank Tester and Glenn Drover from the UBC School of Social Work, largely related to Canada and Canadian First Nations issues, but also including news from around the world. The collection documents First Nations environmental and political concerns, First Nations child and family welfare issues, and media coverage of these and other issues. Also included are copies of British Columbia provincial statutes and regulations dealing primarily with First Nations issues, and reports and other materials documenting the history of Aboriginal communities in British Columbia and throughout Canada. Materials collected by Dr. J. Harry G. Smith of the UBC Faculty of Forestry. The collection consists of materials related to First Nations’ land claims and forestry practices in British Columbia, including correspondence, press clippings, publications, and reports. Research and personal papers of the first head of the UBC Department of Anthropology. Hawthorn and his wife Audrey also played significant roles in the development of the Museum of Anthropology. He was commissioned by the Canadian government to carry out two comprehensive Indian Research Projects: the Department of Citizenship and Immigration’s study of B.C. Indians (1954-1956), and the Survey of Contemporary Indians of Canada (1964-1967). The records include extensive correspondence, survey data, research notes, and reports. These projects influenced the development of both the Canadian government’s First Nations policies and Canadian anthropology. This groundbreaking programme for supporting First Nations education in British Columbia (1970-78) was a precursor to Xwi7xwa Library. Based in Brock Hall, it was funded by government grants and private donations. First director of the First Nations House of Learning, Kirkness was also Education Director for the Manitoba and National Indian Brotherhoods, and is a leader in the development of First Nations education across Canada. Her records document her work as a seminal First Nations educator and administrator. Records in the Dean’s General Administrative series include documentation of the origins of the Native Law Programme (now known as the Indigenous Legal Studies Programme). Records focus on Hunter Lewis, UBC graduate and later professor in the Department of English. He chaired the Committee on Indian Citizenship, and was instrumental in bringing some of the first totem poles to campus. Includes records documenting the establishment and early administrative history of the First Nations House of Learning Xwi7xwa Library, in particular the process of formally establishing it as a branch of UBC Library. Records from the Data Library include files on the B.C. Indian Population Study of the 1960s, and B.C. First Nations language and mythology studies from the 1970s. Includes records relating to First Nations publication projects – e.g. Legends and Teachings of Xeel’s the Creator , B.C. First Nations Studies, and Sima7 . Inventory not publicly available – consult with University Archives staff. Records of the office of the University President. Subject files and correspondence files include references to First Nations groups and issues. William Ridington joined the Department of Anthropology at UBC in 1969. His papers include field notes and transcripts of interviews with members of the Beaver Indian people (Dane-zaa), compiled for a research project. Alan Sawyer was an art historian, collector, curator, and professor whose area of specialization was pre-Columbian First Nations art from North and South America. His papers include correspondence, notes, photographs, and other materials pertaining to his academic research, writing, curatorial and appraisal work. Includes subject files (newspaper clippings, miscellaneous documents) on totem poles, Museum of Anthropology, etc. Newspaper clippings and other collected materials documenting contemporary First Nations artists. Published by the Indian Education Resource Centre (1970-77), the Newsletter regularly included resource materials from the Centre, reports, grant information, recommendations for children’s literature, curriculum ideas, and other news relevant to First Nations education. These publications are also available in their original paper form. Note: When searching pre-1970s publications, use search terms like “Indian” or “Native” or names of specific First Nations using old spellings such as “Nootka” or “Kwakiutl”. For post-1970s searches, currently-accepted terms like “First Nations”, “Indigenous”, or “Aboriginal”, and current spellings such as “Nuu-chah-nulth” or “Kwakwa_ka_’wakw”, can also be used. On-line database of over 40,000 photographs held by the Archives documenting UBC’s growth and development, the evolution of student life, and campus events from its founding to the present day. As with UBC Publications, both historic and contemporary terms (e.g. “Indian” vs. “First Nations”), and the names of specific groups or individuals, can be used to search the collection. The Senate oversees the academic governance of the University. The minutes document its deliberations at its monthly meetings, and will include references to proposed First Nations academic programmes that Senate would review and approve. Records in the Senate fonds also contain reports and other more extensive documentation of those programmes. These unpublished materials are institutional records – access requests are subject to review under FOIPOP guidelines. Part of a larger resource intended as a comprehensive research tool for examining the evolution of the built environment of the UBC-Vancouver campus. It identifies published and unpublished sources, both within and outside the Archives, while providing useful commentary and context. See the Overview for further explanation and context. The “Pre-University” section is organized in four parts: “Coast Salish and Industry”, “Pre-University and UEL [University Endowment Lands] Time Line”, “Important Contacts for Pre-University Site”, and “Bibliography”. Other sections of the website also include references to First Nations information sources. A UBC Archives “virtual display” commemorating Aboriginal Heritage Month (June 2013). It documents the history of the University’s collection and preservation of totem poles and other large-scale First Nations carvings. Two articles, originally published in UBC Recreation’s magazine The Point, documenting how UBC sports teams gained the “Thunderbird” name, including how it was sanctioned by the Kwicksutaineuk people, part of the Kwakwa̱ka̱’wakw First Nation. The symbol of the authority of the Chancellor, the University Mace is displayed during Congregation and other ceremonial occasions. Both the UBC-Vancouver and UBC-Okanagan maces feature First Nations-inspired designs. The article cites the designers and their inspirations. Summary description of the First Nations House of Learning Longhouse from the Archives’ Index of UBC Buildings, listing dates of construction, architects, cost, and prominent architectural features.